Share this product and receive a $5.75 sharing discount. ORIGINAL MOBIUS JEWELRY FROM DVBNY. MADE IN THE USA! 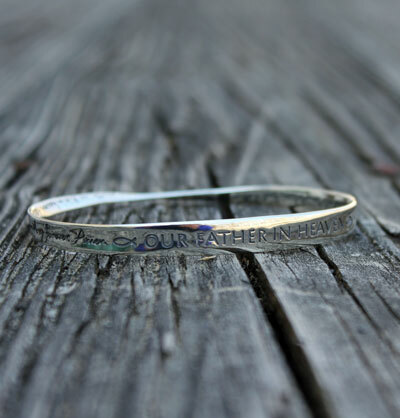 This .925 sterling silver bangle bracelet is finely engraved with the The Lords Prayer (New International Version). "Our Father in Heaven, hallowed be your name, your kingdom come, your will be done on earth as it is in Heaven. Give us today our daily bread. Forgive us our debts, as we also have forgiven our debtors. And lead us not into temptation, but deliver us from evil for yours is the kingdom and power and the glory forever. Amen." The elliptical shape sits comfortably about the hand, while the form itself displays unusual geometric properties. The shape is known as a Möbius strip, after the German mathematician August Ferdinand Möbius [1790-1868]. It represents the seeming paradox of a plane without end, or one of infinite length. 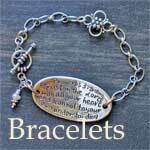 As such it became accepted as a symbol for infinity, an appropriate and symbolic form for these memorable inscriptions. Ellipse: 2 13/16" x 2 1/12" [72mm x 64mm] Width: 3/16"- 5/16" [5 - 8mm] The inside diameter fits an 8 inch wrist or smaller.